French Ambassador in Sofia: "Press freedom of has no borders"
Reporters Without Borders has issued a statement deploring the recent smear attacks on Bivol and its staff by controlled Bulgarian media. 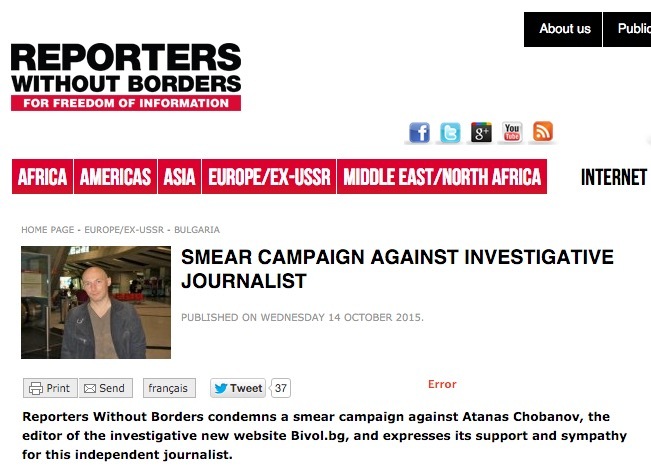 “Reporters Without Borders condemns a smear campaign against Atanas Chobanov, the editor of the investigative new website Bivol.bg, and expresses its support and sympathy for this independent journalist,” the statement reads. Once again, as it happened way too often in recent years, Bivol, one of the few sites for investigative journalism in Bulgaria, is under unprecedented attacks and vilification launched by certain media and individual journalists associated with the most influential political and economic circles in the country. It is evident that these attacks are motived by Bivol’s investigations. Everything that is currently happening shows that Bulgarian journalists work in an extremely distorted media environment. Those who respect ethical and professional standards are unprotected and harassed, while the rest are under the political and economic pressure of media owners (sometimes fictitious) linked to politicians from the higher echelons of power. There is no other explanation for why journalists are being forced to engage in slanderous attacks against their colleagues. Journalistic solidarity and professional standards in Bulgaria are utterly crushed, both because of the non-transparent media ownership and because of illicit connections, and sometimes downright mergers of media ownership with the economic and political oligarchy. In our country there is a paradox with media monopoly being an open secret, a secret with which the Bulgarian magistrates and the political and economic oligarchy blissfully coexist. We draw attention to the fact that the integrity of Bivol’s investigations and publications has not been and is not challenged in any way, despite repeated attempts to pressure our colleagues. The journalists from Bivol are part of the Bulgarian Association Network for Free Speech, established to defend and protect the professional and ethical standards of journalism and the right of citizens to obtain reliable information. We have no reason to doubt the good faith of our colleagues, the journalist from Bivol, and we stand behind them not only because they are our members. We assure you that we would similarly support every journalist who is a victim of persecution because of their work. Remaining silent about what is happening equals giving consent to keep working in an environment that is devastating for the profession and for society; to surrender to corruption and backstage dealings and become part of them. We urge you to pay attention to this and other cases; we are ready to provide all the facts at our disposal. Journalistic solidarity is part of the ethical standards of the profession. In Bulgaria to date, we cannot cope on our own. The position has been sent to all embassies of European countries in Sofia. Each Bulgarian media that believes that freedom of speech is a fundamental value of journalism is free to inform its viewers, listeners and readers.